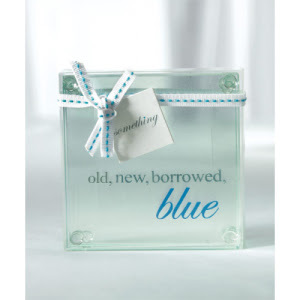 When I think of wedding traditions the first thing that comes to mind is something borrowed, blue, old and new. Every bride I have talked to can list off all of the items they used for this tradition. Most of the items you will choose as a new bride will be from friends and family. But incase you are in need of some new, fun and creative ideas we have formed a list for you to choose from. - One idea a lot of people have been doing this summer is using a a classic car for transportation on the big day. - You could find a vintage pocket mirror and place it in your purse for the night. - Have the ceremony or reception at a historical location. - Borrow a book from the library that has a poem or reading you would like read at your ceremony. - Borrow a man or a women's button down shirt for when you get your hair and make up done. - Put one blue flower in your bouquet if blue isn't in your color scheme. Another creative idea is you could tie the items you find or buy into the theme of your wedding.